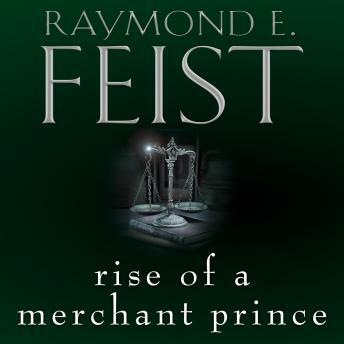 The second book in Raymond E. Feist's super-selling quartet: The Serpentwar Saga. Triumphant but overconfident after his defeat of the reptilian Sauur army, Roo must resist a beguiling seductress who threatens to undo him and all of Midkemia. Recently returned from a harrowing brush with the armies of the Emerald Queen, Roo is now free to choose his own destiny and his ultimate ambition is to become one of the richest and most powerful merchants in Midkemia. But nothing can prepare him for the dangers of the new life he has chosen, where the repayment of a debt can be as deadly as a knife in the shadows. Even those closest to him are suspect and as Roo struggles to build his financial empire, betrayal is always close at hand. But while Roo works towards achieving his goal, memories of the invasion haunt him still. For the war with the Emerald Queen is far from over and the inevitable confrontation will pose the biggest threat yet to his newfound wealth and power. Rise of a Merchant Prince is the second book in the Serpentwar Saga. Rage of a Demon King is the third book in the quartet.